A team of astronomers working at the National Centre for Radio Astrophysics (NCRA, TIFR), Pune, India have discovered, using the Giant Metrewave Radio Telescope (GMRT), an extremely rare galaxy of gigantic size. This galaxy — located about 9 billion light years away towards the constellation Cetus — emits powerful radio waves and has an end to end extent of a whopping 4 million light years (The Milky Way is only 100,000 light years in diameter). Such galaxies with extremely large 'radio size' are appropriately called giant radio galaxies. How do galaxies with an optical size of a hundred thousand light years produce radio emission several million light years in extent? It is argued that the presence of a super massive black hole at the centre of the galaxy drives large scale jets of hot plasma in diametrically opposite directions which eventually give rise to large radio lobes (see the image above). While radio galaxies with size less than a million light years are common, giant radio galaxies are extremely rare, even more so, at large cosmic distances where only a handful have been discovered so far. This newly discovered galaxy known by its scientific name 'J021659-044920' is the newest member of this elite group. Under some special circumstances, the central black hole may stop producing the radio jet, and then the bright radio lobes fade away, within a few million years, due to lack of replenishment. What makes J021659-044920 special, is that it has been caught in this dying phase, where the radio jet appears to have switched off and the radio lobes have started fading. The fading of the lobes is caused by their losing energy in two ways, one, by emitting radio waves which show up as the gigantic radio lobes and two, by transferring energy to photons from the cosmic microwave background via a process known as inverse Compton scattering. This latter mechanism leads to faint X-ray emission, which is seen to emanate from the radio lobes of this galaxy. Such dying radio objects are best studied using a low frequency radio telescope such as the GMRT. The GMRT, the world's largest radio telescope facility operating at low radio frequencies, is an array of 30 fully steerable, 45 metre diameter antennas, spread out over a 30 km region around Khodad, near Narayangaon town of Pune district in western India. The GMRT was built and is operated by National Centre for Radio Astrophysics of the Tata Institute of Fundamental Research and has been in operation since 2002. The optical image above shows with radio lobes (in yellow-red). The supermassive black hole in the red galaxy at the centre (zoomed in inset) has led to the formation of the giant radio lobes. For their analysis, the team combined their GMRT observations with previous observations made with a slew of international ground and space based telescope facilities — XMM-Newton Space Telescope in X-ray, the Japanese Subaru telescope in optical, UK's Infrared Telescope in near-infrared, NASA's Spitzer Space Telescope in mid-infrared and the Jansky Very Large Array (USA) in high frequency radio bands. 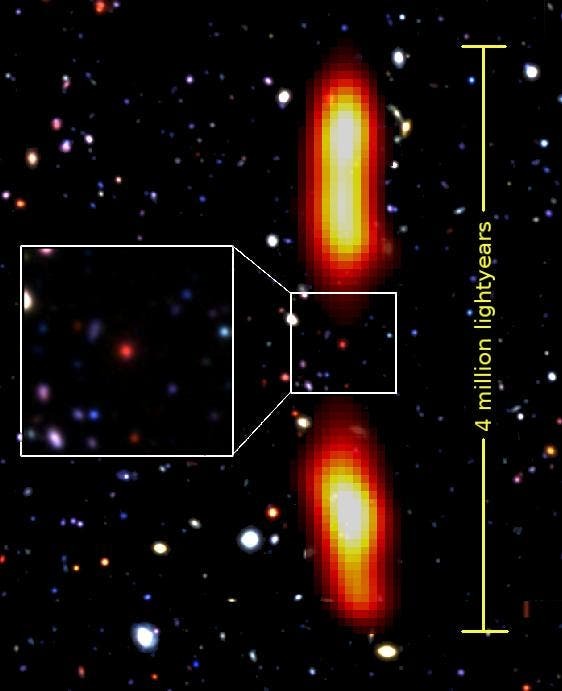 By using data from multiple telescopes spanning across the electromagnetic spectrum, they were able to carry out a comprehensive and incredibly detailed analysis of the physical conditions around this distant galaxy. The properties of the magnetic field in the region between galaxies in the distant universe can be understood with these observations.